While I may ride a Dutch bike, that's not the standard bike for everyone in my family. My stepson a.k.a. "Little Ding" took up biking this past spring when we found a way to adapt a standard kid's bike to work with some of the unique challenges his Cerebral Palsy brings to riding a bike. The sense of independence that any child feels when riding a bike is even greater for children with special needs. Once Little Ding was on his bike he was just another kid on a bike - not a kid with CP or a kid with special needs, just a kid out on a bike like all the other kids. 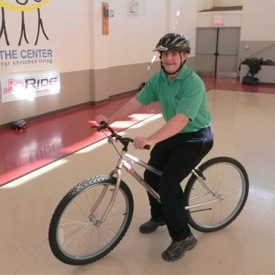 A bike can be incredibly equalizing and empowering for kids with special needs. It's no surprise then that I'm always on the lookout for adaptive bike manufacturers. I try to keep my Adaptive Bikes page up to date and keep an eye out for any new adaptive bike products. Before the holidays I learned about new adaptive bike manufacturer located here in Chicago. A friend of mine pointed out an article in Crain's Chicago Business about a local father who started a bike company after trying to figure out a way for his autistic son to ride a bike. Steven Cohen's eleven year-old son Joey wanted to ride a bike just like all his older siblings. Unfortunately for Joey, who is autistic, the pedals just seemed to get in the way and he could never quite get the hang of pedaling and riding a bike at the same time. Instead, Joey would stand next to one of his brother's bikes and walk it around. Steven, an avid cyclist, motorcyclist, and basic gear-head, started tinkering around with an old bike. First he took off the pedals, then the crank, the chain, the derailleur, etc. He got Joey to straddle the bike, adjusted the seat post, and Joey had a perfectly-sized version of a toddler's balance bike, or more aptly named 'Walk-Ride' bike! 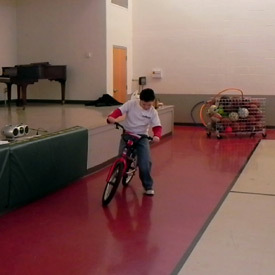 Since that day Joey has mastered bike riding and can propel himself on his bike, coast, and then push off again. Now Joey goes on bike rides with his entire family - he can easily keep up a pace of about 5-8 miles an hour on his own bike. Steven didn't stop there. With a background in manufacturing via his family's Aaron Equipment Company Joey's first bike became the prototype forJoRide Biycles - the company he started to manufacturer adaptive bikes for children and adults. 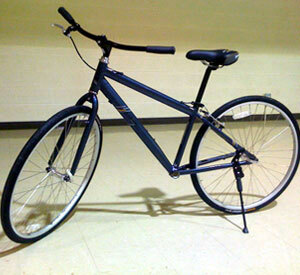 They make "Walk-Ride' bikes in a mountain or hybrid-style bike, as well as a popular BMX style. Along with the bikes, Steven has developed a training program to teach both kids and adults how to ride one of his "Walk-Ride" bikes. JoRide has already partnered with organizations likeThe Center for Enriched Livingin Riverwoods, IL, Autism Speaks, The Northern Suburban Special Education District (NSSED) in Illinois and the Northern Suburban Special Recreation Association (NSSRA) also in Illinois, to host riding programs and adaptive PE classes using JoRide bikes. You can contact one of these organizations or Steven himself to find out more information on upcoming classes, or send an email to Steven if you are interested in purchasing a bike. Check out the JoRide website or send Steven an email at Steven at JoRide dot com.